A photographer (Nancy Snyder) investigates the mysterious death of her plant-loving sister (Nancy Boykin). In 1968, Clyde Baxter published an article called “Evidence of a Primary Perception in Plant Life”, claiming that when he hooked a plant up to a polygraph machine, the plant reacted to thoughts and threats. It’s an intriguing idea — after all, plants are alive, so isn’t it possible that we’re underestimating their potential for sentience? — but Baxter’s “experiment” has since been roundly debunked. Back in the day, however, the “secret life of plants” was apparently ripe with dramatic possibility — and, combined with the equally new-agey concepts of Kirlian photography, auras, and psychic transmission, formed the basis of this minor cult flick by independent writer/director Jonathan Sarno. 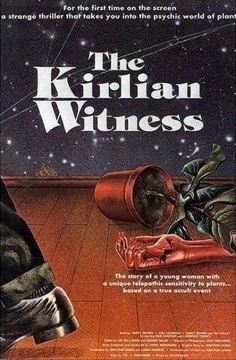 The Kirlian Witness was marketed as a horror film upon its release — indeed, my local video store inexplicably continues to file it in the horror section under “When Plants Attack” (!?) — but, as pointed out by Shane Burridge in his review (see link below), it’s actually more of a crime thriller than a horror flick, with amateur sleuth Nancy Snyder attempting to find out the identity of the killer while placing her own life in danger. As such, it’s a reasonably well-done, albeit unevenly paced, independent feature — and though there are only two primary suspects, Sarno manages to pull a nifty plot twist at the end. Nonetheless, all the nonsense about psychic plants and auras ruined my overall enjoyment of the film, and ultimately elicited more groans than chills. No. Though it developed a small cult during the time of its release, I don’t think this curio remains must-see viewing today.